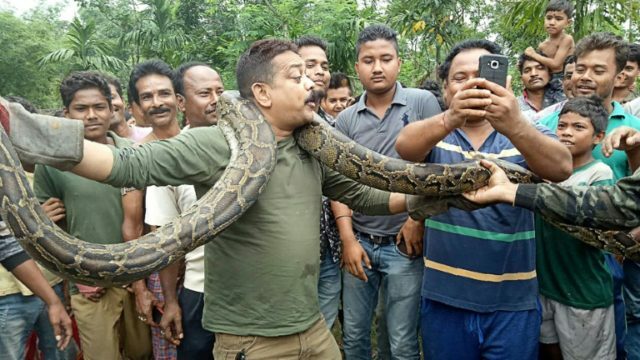 Kolkata (AFP) – An India forestry ranger found himself in a bind after a python briefly strangled him while he posed for pictures with the giant snake. Wildlife officer Sanjay Dutta was called in Sunday by frantic villagers in West Bengal after they saw the 40-kilogramme (88-pound) python swallowing a goat alive. Instead of placing it safely inside a bag, the ranger wrapped it around his neck and posed for pictures with stunned villagers. But panic spread as the huge snake wound itself around Dutta’s neck, forcing him to struggle to free himself from its vice-like grip. He escaped unscathed, but a little red-faced. The Indian rock python is a non-venomous species, but it can quickly kill its prey by constricting blood flow and can grow up to 10 metres (33 feet) long. West Bengal’s forest department has launched an official inquiry into the ranger’s conduct and flouting of safety protocols. But Dutta said he only wanted to save the reptile from the villagers who were readying to club it to death with sticks. “My first instinct was to rescue the snake. I carried it on my shoulders and held its mouth firmly,” Dutta told AFP. Dutta said he did not have a bag to carry the snake, which he transported to a safe location in his car and released into the wild.